You can always tell when it is spring time in New Mexico cus the wind gets really bad and just goes nuts. This weekend has been a good example of that. Today the strong wind has made everything total crap, and is why I am playing hermit and hanging around my house instead of doing stuff that I wanted to outside of the house. 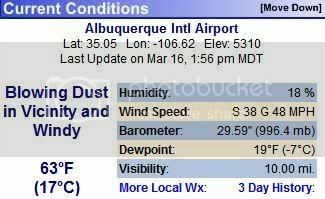 The image that is at the right side here is of a quick snap shot of the weather today here in the Albuquerque Metro Area from the National Weather Service. Incase you do not know how to read the Wind Speed line, "S 38 G 48 MPH" really means "Sustained winds South at 38 MPH with gusts to 48 MPH." No, you did not miss-read that. The wind is really blowing at 38 MPH with gusts around 48MPH. Also when they say "blowing dust" that is really the understatement of the century as right now there is so much dust in the air that the air looks dirt brown. Also I just looked out one of my windows which faces the street and there are minor tree branches everywhere, which I will have to be mindful of when I go down to the office later and I must make a mental note to not drive my normal warp 5 that I do. So I have diagnosed myself with another disorder, Dyslexic dysgraphia, which is a type of Dysgraphia. A while back (3 or 4 years) I finally put two and two together and figured out that I was Dyslexic. Part of it is my hate for reading (or really how hard it is for me) and the fact that I transpose letters and numbers like its going out of style. There are other things, but those are the big ones. Anyway, back to the Dysgraphia. Back in late February I was watching CNN Headline News when they kept teasing a story about a boy who started his own charity to help homeless kids in LA. Well I had to run out before they ran the story, so I just set my DVR to record it. When I got back around to watching it, I found out the kid had Dysgraphia and I really wanted to do some research on it, but never got to it. So today when I was going back thru my DVR and all the crap that I keep on it (there is a lot), I found that story again, so I figured I would look at what Dysgraphia was all about because the kid really reminded me of myself in what he has gone thru cus of the condition. So I throw the word "Dysgraphia" into Wikipeida and start reading. When I got to the part about "Dyslexic dysgraphia", it was like, "Holy crap, that is me in a nut shell". lol. The article said (for those of you who did not click-thru) "With dyslexic dysgraphia, spontaneously written work is illegible, copied work is fairly good, and spelling is bad.". Anyone who knows me, or knew me growing up knows that is me in a nutshell. My spelling is total crap (I run most of my LJ posts thru spell check) and my hand writing is crap unless I am copying from something else. Another thing related to the Dysgraphia, is "Pain while writing". Sometimes when I have been hand writing things for a while, I will get a pain my hand that basically feels like a hand cramp, which I have always just written off (bad pun) as being from writing too much or something like that. I never really once thought that it was because of something else, which is why I never really made a big deal about it. So ya, just add Dyslexic dysgraphia to my long list of disorders (ADD, ADHD, LD, and Dyslexia) that I have. You can file this one under the "Other Random Musing" category. Last night (well really this morning) I stayed up until 5am doing stupid junk, like reading a blog of the guy who owns the DNA Lounge in San Francisco, CA about all the "fun" he had trying to buy the bar / night club and then doing the remodel and trying to get all the permits and junk. Anyway, I had planned on getting up for church this morning since it is / was Palm Sunday, but after going to bed around 5am, ya, that did not happen. I know it was stupid (trust me, I know that). I can’t pull this crap next week as its Easter Sunday and I really do need to be in church next week. All I hope is that can get to sleep tonight at a normal time as I really need to get my sleep schedule back on track so I don’t pull this crap (again).